As carbon and other greenhouse gas (GHG) emissions have increased dramatically in the past few decades, the threat of climate change has also grown. Solar energy is a renewable, carbon-free resource available in every geographic region of the U.S., with enormous potential to reduce our nation’s GHG emissions. Any market or policy solution to climate change must include significant development of solar energy to power a clean, affordable economic future. The electric power sector is among the largest contributors of greenhouse gases in the United States, representing 28% of all emissions. 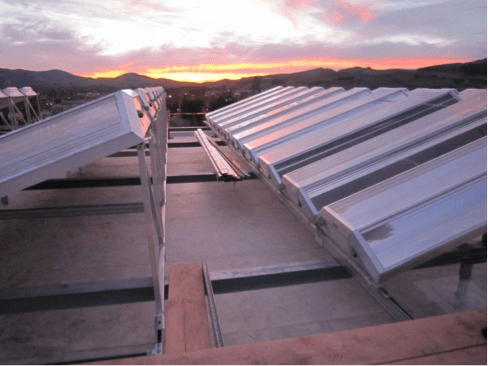 Solar heating and cooling systems can provide about 80% of the energy used for space heating and water heating needs. While there may not be one technology that can reduce all U.S. GHG emissions to zero, solar technologies are a crucial component of our nationwide effort to curb emissions and achieve ambitious climate goals. Solar energy is not just a solution that can help mitigate our impact on the climate, it also contributes to the resiliency and reliability of our electric grid, making America more energy secure in the face of increased natural disasters and powerful storms that become more frequent in a changing climate. 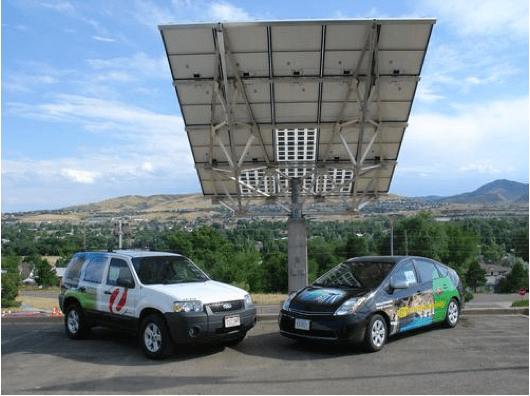 Electric vehicles (EVs) and plug-in hybrids are widely seen as one of the near-term climate change solutions in the transportation sector, especially when these vehicles are charged by a solar-powered carport or charging station. EVs are an increasingly important component of distributed solar power, helping American families reduce their carbon footprint by creating an end-to-end system that includes rooftop solar, home battery storage, and electric vehicles. The U.S. is a highly industrialized country, and therefore a large portion of our GHG emissions stem from the industrial sector. The manufacturing of common materials such as aluminum and steel are energy intensive and generate high levels of GHG emissions. One of the main uses for energy in the industrial sector is for boiler fuel, meaning that energy is needed to generate steam or heat water, which is then transferred to a boiler vessel. Another use for energy is for process heating, when energy is directly used to raise the temperature in a manufacturing process, such as in drying paint in the automobile industry, and cooking packaged foods.3 Solar energy can offset the need for fossil fuels by generating high-temperature and medium-temperature heat from CSP and SHC technologies. The commercial sector includes buildings such as offices, malls, warehouses, schools, restaurants, and hospitals, while the residential sector consists of homes and apartments. Both commercial and residential buildings spend the majority of the energy consumed on space heating, space cooling, and water heating. This is a perfect application for SHC technologies, as the SHC systems can provide about 80% of the energy used for space heating and water heating needs. Furthermore, solar air conditioning can be used as a clean, emissions-free solution to meet cooling needs instead of using electricity. Solar PV is a favored form of electricity for many leading businesses and corporations, who are powering their warehouses, headquarters, and distribution centers with large rooftop systems. Solar produces less life-cycle GHG emissions than conventional fossil fuel energy sources.4 While there may be some GHG emissions produced during the manufacturing and recycling of the solar system, the generation of energy results in zero GHG emissions and zero environmental impact. SEIA supports comprehensive climate and energy legislation, and is opposed to any legislation that would weaken the Clean Air Act. There are several domestic policy priorities, including tax policy, workforce development and infrastructure, that SEIA members are engaged on to encourage deployment of low-cost solar energy in the U.S.
Intergovernmental Panel on Climate Change - International scientific body that compiles data for the assessment of climage change, including environmental, social, and economic impacts. Greenhouse Gas Reporting Program - A program run through the EPA in response to the Mandatory Reporting of Greenhouse Gases Rule (74 FR 56260) which requires reporting of ghg data and other relevant information from large sources and suppliers in the U.S. to inform future policy decisions. Greenhouse Gas Data from UNFCCC - data from countries around the world.